There is a long list of wonderful people and brands that helped us to make the distance to Chile. Behind each piece of kit that we were sponsored was an awesome person who we connected with. We thank you all for believing in us, for reaching out to us and for sticking with us through it all. Your efforts and energy made a difference to us everyday and we thank you for your generous support. We also want to make special mention of all the bike mechanics, bike shops and random punters that helped us out along the way. Every time that something went wrong (which was a lot), there was always someone close at hand with the right advice, tool or vehicle to get us closer to both. People are inherently good – despite what your television will have you believe – and bike touring brought all the good ones out to meet us. Thank you all. Big Thanks to Matt Falon of Black Mountain Bicycles in San Diego. He truly is a master wheel builder and an absolute legend to boot. He went to extreme lengths to get us spare parts in Peru when we needed them most and without his help, we may still be there. We made this video of the Best Christmas present ever – Saludos Matt! As of February 2014, we are Totally Keen about our new cleated sandals! Thanks to the support from Keen Footwear for the pro deal on our new riding shoes, we have been saved from the stress of touring without cleats! We are stoked to be in comfortable and cool shoes. Now we are fully ready to see what we shall find along the way! As of December 2013, we have the support of the worlds most famous bike saddle, welcome aboard Brooks England!We are now running on a fancy new B17 saddle, and Bren could not be happier! Supporting us with a pro deal, this new saddle is more suited for long distance touring. And of course, it is terribly stylish! We thank Brooks England for letting us take a prestigious seat. 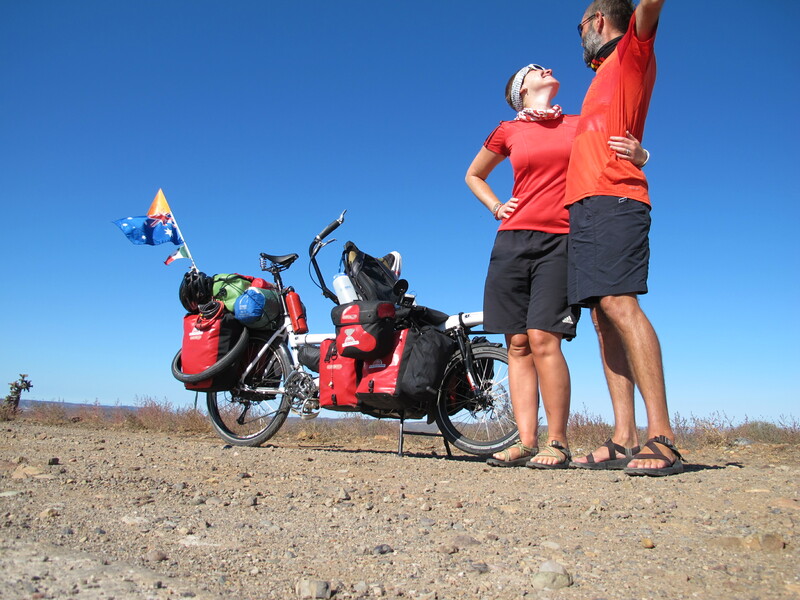 As of November 2013, Carmex Australia have come on-board to get involved with protecting our lips from the rigours of bike touring. As a sufferer of cold sores, protecting my lips from the elements is vital to me. Protection is way better than cure, and Carmex is the only thing I trust to keep the sun, wind and those pesky blisters at bay. As of May 2013, we have the much needed support of RockTape. We will need their kinesio tape to keep our knees functioning throughout the trip. Going stronger, for longer, indeed! As of April 2013, things have gotten seriously cool with the support of HooRag. Their seamless bandanas will not only make us look cooler, but will help to protect us from the elements and make our days brighter! Its not just a bandana, its a HooRag! As of April 2013, we have become seriously loud with the addition of The Hornit – the seriously loud cycle horn! At 140dB, we are making a whole lotta noise to say thanks for this support! As of March 2013, we are celebrating the support of adidas Japan. We are doing a happy dance in our triple stripe gear and love having them on the adventure with us! Cheers adidas! As of February 2013, we welcome onboard Allegro Bikes. We are loving their support in sponsoring us some amazing Ortlieb panniers! Wow guys! Thank you Allegro! As of 20th February 2013 we are stoked to have SealSkinz as our first official sponsor! Thank you SealSkinz for supporting us!